CHI St. Luke's Memorial Hospital in Lufkin, Texas had a problem many organizations face – there was little to no cellular coverage inside the hospital buildings. The problem is that the concrete and metal in the buildings blocks the cell signal from getting inside where it is needed by the staff. In many areas of the hospital, the staff simply could not use their cell phones. Initially the hospital considered installing a traditional DAS (distributed antenna system) throughout the various buildings of the campus to improve cell reception. However, at upwards of five dollars a square foot, this simply wasn't an option for budget reasons. That's when the installer stepped in and let the hospital know that for 1/10th of the price of a traditional DAS system, he could install a WilsonPro passive DAS or commercial signal amplifier system. This would provide cell coverage in all the areas where it was needed. Within a few weeks, the installer had the hospital up and running with a WilsonPro cellular amplifier system. Now the hospital staff can place or receive calls, send and receive texts as well as download and upload data throughout the numerous hospital buildings. If you're facing a similar situation in your building and need strong cellular signal inside, look no further than WilsonPro commercial cell signal booster systems! 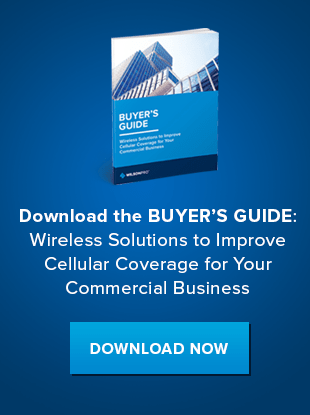 Download our Buyer's Guide to determine which wireless solution is best for you.